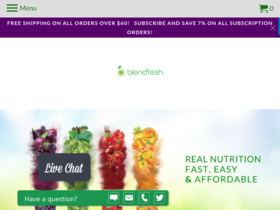 Sign up today and enjoy a 10% discount from Blendfresh. Enjoy a 25% savings when you buy in bulk from Blendfresh online. Enjoy free shipping on orders of $60+ from Blendfresh.com. Check out Blendfresh online for their latest special offers.